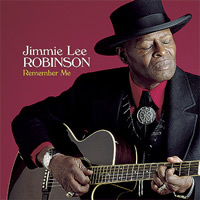 Jimmie Lee Robinson doesn't dance for the approval of others nor does he thin his music to seduce a wider audience. The self-proclaimed Lonely Traveller's work is an artistic achievement that illustrates why enduring reputations are earned slowly, over time, not swiftly via shrewdly orchestrated media blitzes. His music, honest and unspoiled, comes as a welcome and refreshing alternative in an age of crowd-mesmerizing pyrotechnics, outlandish tempos, and incendiary solos. Remember Me, Robinson's first effort for the APO label and the first album recorded at Blue Heaven Studios, is an adventure deep into the blues of Mr. Robinson's Maxwell Street neighborhood, a neighborhood that has included residencies with musicians such as Little Walter, Howlin Wolf, Freddie King, Elmore James, Luther Tucker, Eddie Taylor, Magic Sam, Jimmy Reed, Shakey Jake, St. Louis Jimmy, Eddy Clearwater, Sunnyland Slim and more. On Remember Me, Robinson accompanies himself on acoustic guitar to create The Lonely Traveller's distinctive brand of blues, which he says represents a lifetime of work, the trials and tribulations of growing up on and experiencing Maxwell Street. If you listen closely, you'll also hear Jimmy D. Lane (son of the late blues legend Jimmy Rogers) accompanying on one tune. Robinson sings in the powerful and sometimes piercing voice that inspired the Lonesome Lee sobriquet when he began recording for Bandera Records in the 1950s. Boot-stomping, spur-jangling highlights include a rousing performance of "Wait For Me", Jimmy Reed-inspired "Boss Man" and a spirited rendition of "Wagon Wheels".